Adilur Rahman Khan, Secretary of Odhikar was picked up by approximately 10 plainclothes men from the Detective Branch of Police (DB) at 10.20 pm on August 10, 2013 and taken to the DB custody in Mintoo Road, Dhaka. He was picked up in front of his house at Gulshan, after returning from a relative’s house with his wife and children. The Odhikar office and his home are situated in the same building. The men who picked him up had no arrest warrant. Different news agencies reported that he was ‘arrested’ with regard to Odhikar’s fact finding of the Hefazate Islam incident on 5 – 6 May, 2013 as Odhikar through its fact finding revealed and reported that 61 persons had been killed during the Shapla Chottor crackdown. Odhikar defenders went to the Gulshan Police Station at 2:00 am on 11 August, where the police present denied having any case against him with them and claimed that they learnt of his arrest from the media. Later on, at approximately 3 in the morning, Saira Rahman Khan, the wife of Adilur Rahman Khan returned to the Gulshan Police Station and tried to lodge a General Diary. The duty officer there refused to accept it, stating that it was a ‘sensitive case’. She demanded to speak to the Officer in Charge of the Police Station and when he was called up, he also refused to accept it. The Government claims that he had been ‘arrested’, however, there was no prior warning or warrant. Earlier in the evening, at approximately 12:30 am Saira Rahman Khan and Odhikar defenders went to the DB office at Mintoo Road Dhaka where the sentries denied them entry. Odhikar released the fact finding report on the human rights violations perpetrated at the Hefazate rally in Motijheel on 5 – 6 May 2013, (see www.odhikar.org)on June 10, 2013 the Information Ministry issued a letter on July 10 , 2013 asking for the names, family names and addresses of 61 deceased people. Being a human rights organisation and committed to defend the rights of people, Odhikar did not give the list to the government. In its reply letter sent to the Information Ministry on July 17, 2013; and concerned for the security of victims families; Odhikar requested those concerned to form an independent impartial commission headed by a retired judge , where odhikar is willing to submit the names of the 61 victims killed. On 11 August, at around 1.20 pm Adilur was taken to the Chief Metropolitan Magistrate’s ( CMM) Court where the complaint against him was read by the public prosecutor. It must be mentioned here that the complaint lodged against Adilur Rahman Khan was only handed over to his lawyers after he was presented before the Court. The complaint was signed by Mohammad Ashraful Islam, ID 7199042827, (team 8), DB Police (North), Dhaka Metropolitan Police, Dhaka. There were two General Diaries lodged against him by police. In one he was shown arrested under section 54 of the Code of Criminal Procedure in the General Diary number 268, dated 10/8/2013 filed by the Detective Branch of Police (North). The other one was lodged in Gulshan Police Station and was numbered 514 of 10/8/2013. He was also charged under clauses 1 and 2 of section 57 of the Information and Communication Technology Act 2006 for publishing false images and information and disrupting the law and order situation of the country. The complaint also states that there is reasonable suspicion that Adilur Rahman Khan is also directly and indirectly liable for other cognizable offences. 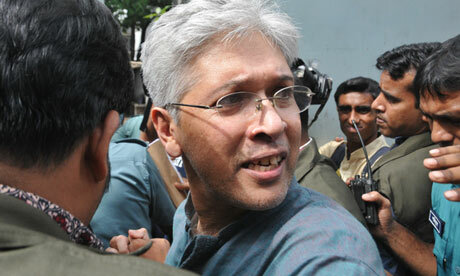 The public prosecutor sought ten days remand while the lawyers on behalf of Adilur Rahman Khan sought bail. The Magistrate, Amit Kumar Dey rejected the bail petition and granted 5 days remand. He was then taken back to DB office. It must be noted that the police at the Gulshan Police Station had denied that they had any information or case against Adilur Rahman Khan on 11 August 2013. Meanwhile on 11 August 2013, the Odhikar office was searched by DB police between 8.20 pm and 9.00pm. They inspected the files and documents and then seized three laptops and two CPUs from Odhikar’s office. Odhikar urges all concerned to strongly protest the illegal arrest of Adilur Rahman Khan and continue campaigning for his release. Odhikar condemns the picking up of its Secretary Adilur Rahman Khan by the Detective Branch of Police ,his detention and the fabricated allegations against him. The Organisation also condemns the order of remand passed on Adilur, who is not only a human rights defender but also a respected Advocate of the Supreme Court of Bangladesh.